Things are getting slowly ahead – W.A.P. Our Church in Antarctica and its connected activities, are getting ahead even slowly. Mons. Marco Bagnara from La Guardia’s Sactuary has written another chapter of this story on la Guardia Bulletin of March 2007. 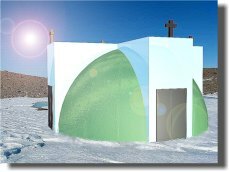 Our Church in Antarctica should be built at the Italian Base MZS and it will be dedicated to the Virgin of La Guardia , who have already over 300 Sanctuaries in the world. Our Church in Antarctica is a proposal arising in the year 2003 and WAP is trying to do his best to enlarge the share of this initiative. studies and researches , the peace and the hard job done by personnel …. but we also wish to remind that, such a treasure, is given us by LORD. that’s why we strongly believe that a Church over there is the best touch of our love to Him. WAP non only science … not only Hams or QSLs!